Case Study: Accelerating Product Launch While Creating Quality System | RCA® Inc.
Small or emerging life science organizations often put off hiring quality executives, exposing the company to risk or worse. Other organizations add full-time leaders before they have full-time needs, resulting in over-spending. This case study suggests another model: variable outsourcing of quality leadership to best match needs and spending. Copyright © 2019 by Regulatory Compliance Associates® Inc.
With RCA®’s outsourced QA expertise and their implementation staff, the subsidiary was able to launch the product, comply with all regulations, pass regulatory audits, and implement their Quality System without hiring expensive executives. The FDA Quality System (QS) regulation applies to finished device manufacturers who intend to commercially distribute medical devices. Design controls for new product development are part of a Quality System. 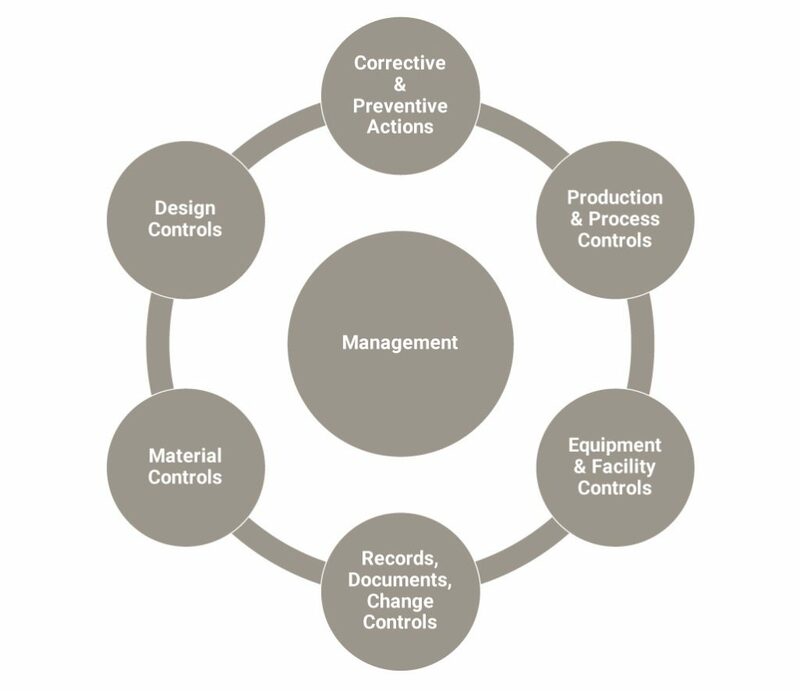 Within Design controls is the design history file (DHF) which demonstrates the product design was developed in accordance with the approved design plan and the requirements of the regulations (21 CFR Part 820.30). A fortune 500 consumer products company was planning new product development for their initial foray into the medical device space. Their accomplished design team was introducing an innovative therapy for home use. Recognizing that risk insulation and speed to market would be critical for early adoption and success, the parent company decided to create a new subsidiary to develop and launch the product. The seasoned Quality Assurance (QA) management elected to stay with the fortune 500 enterprise instead of joining the subsidiary, whereas some of the early and mid-careerists were attracted to the start-up venture. The subsidiary realized they had staff to implement but lacked QA leadership and deep medical device expertise. To accomplish the resulting QS system, see figure 1 below, RCA provided the subsidiary with experts in product design, including mechanical electrical, software and user advocates, as well as experts in quality systems and design history files. With RCA’s outsourced QA expertise and their implementation staff, the subsidiary was able to launch the product, comply with all regulations, pass regulatory audits, and implement their Quality System without hiring expensive executives. Additionally, some of the subsidiary staff saw RCA as mentors, used this opportunity to enrich their skills, and increased their contribution to the organization. Over time, there were some internal promotions within the QA team as RCA helped create a culture of grooming and promoting from within. The subsidiary continued their engagement with RCA to enrich their QS with subsequent phases including transitional quality process control, Product Complaint Handling, CAPA, Quality Manual, Regulatory Reporting, Internal Audits, Post Production and Management Review. As these milestones were achieved and as company sales grew, the subsidiary became attractive to investors and was sold to an established medical device company.